1. Training Police. Four years ago, the United States began a program to train women police officers focused on crisis management, first aid, and ways to work with female victims of crime and domestic violence. On November 27, nine more women police officers completed the training program bringing the total number of program alumna to 150. You can learn more here. 2. Educating Future Leaders. Sharing expertise and building networks to work on common issues are key element of U.S. government professional exchange programs. 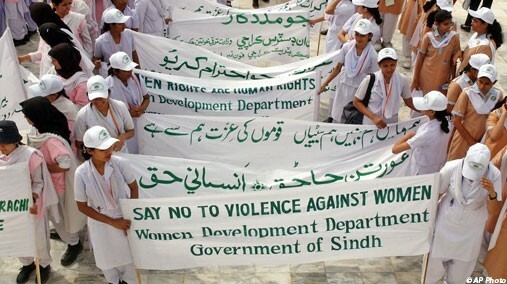 In 2010, the U.S. government invited more than 25 Pakistani women and men to the United States to build partnerships with Americans to further efforts to empower women, eliminate violence against women and combat human trafficking. 3. Engaging Students. As part of the Embassy’s regular outreach to schools and students on a wide variety of issues and topics, Dr. Marilyn Wyatt participated in a roundtable discussion with gender studies students on December 8, at Quaid-i-Azam University in Islamabad. “Violence against women negatively impacts all of society,” Dr. Wyatt said. You can watch her give her remarks here. 4. Promoting Women’s Enterprise. Expanding education for women, setting up legal aid clinics, and advancing public education campaigns on women’s issues — what do they have in common? They are some of the projects being funded through the U.S. Embassy Gender Equity Program. This $40 million program provides grants to local organizations working on women’s issues throughout the country. 5-8. Supporting Benazir Bhutto Centers. We are supporting four of the Shaheed Benazir Bhutto Women’s Crisis Centers in Pakistan. These centers provide health care services, legal assistance, counseling, and temporary shelter for victims of violence. Dr. Wyatt visited the Islamabad Center on December 2 to talk with women who have escaped domestic violence with help from the center. You can learn more about the visit on our Facebook page. 9. Promoting Women’s Services. As Secretary Clinton said, “Investing in the potential of the world’s women and girls is one of the surest ways to achieve global economic progress, political stability, and greater prosperity for women — and men — the world over.” The U.S. Embassy is empowering women through microfinance grants to help women become economically active and increase their incomes as well as vocational training programs to encourage women to learn “non-traditional” skills. Our efforts include programs to unite the millions of home-based women workers across Pakistan to enable them to share information, advocate for their economic interests, and push for fair treatment under the law. 10 & 11. Sharing Expertise. Whether participating at seminars with think tanks, joining protests in the streets, or using art exhibits to highlight violence against women, U.S. government exchange alumni were out in force over the “16 Days” campaign. The Pakistan-U.S. Alumni Network organized two panel discussions on women’s issues for students in Islamabad and Rawalpindi. Experts from the legal field, academia, politics, and civil society came together to share perspectives and educate the next generation on how they can work together to empower women in Pakistan. 12. Training Health Workers. The U.S. Embassy has helped train 11,000 female health workers in group counseling, childhood illnesses, and maternal health. We are further improving maternal health by training 1,600 birth attendants and providing vitally-needed equipment to 1,000 community midwives. 13. Encouraging Women Activists. The “16 Days” campaign is an important opportunity to recognize the amazing work that activists and NGOs are doing in Pakistan to eliminate violence against women. Ambassador Munter and Dr. Marilyn Wyatt met women in Lahore and Islamabad who run NGOs that help shape legislation to protect women’s rights. 14. Reducing Sexual Harassment. We are partnering with Potohar Organization for Development Advocacy to combat violence against women in flood-affected areas by raising awareness about newly passed anti-sexual harassment legislation and providing vocational skills training to women in these areas. 15. Improving Agriculture. Through agricultural programs, we are helping women farmers develop skills and techniques to improve their access to markets. In the rural Baluchistan border area we have mobilized 211 women’s agricultural community organizations to enable women to have direct access to markets. 16. Using the Power of the Media to Raise Awareness. To mark the last day of the “16 Days” campaign on December 10th, as well as International Human Rights Day, Dr. Marilyn Wyatt discussed the U.S. commitment to improving the lives of women in Pakistan in a nationwide interview on Pakistan Television (PTV). You can watch her interview here. Please comment on this post here and subscribe to the blog to receive future updates! I am a State Department Public Diplomacy (PD) Officer working in the Press Section at the US Embassy in Islamabad. This entry was posted in In Pakistan, Women's Empowerment. Bookmark the permalink.